Unleash your inner athlete with the Everlast Elite Adjustable Speedbag Platform. This affordable, 24-inch board accommodates any size speedbag and is adjustable to suit your height using a convenient spring pin lock. The 1 inch thick strike board is perfect for training like a pro in the comfort of your own home. It comes complete with swivel and two brace boards for added support and stability and includes assembly hardware and full-end padding safety. You'll have to supply your own punching bag and the wall mounting hardware is easy to find at any hardware store. 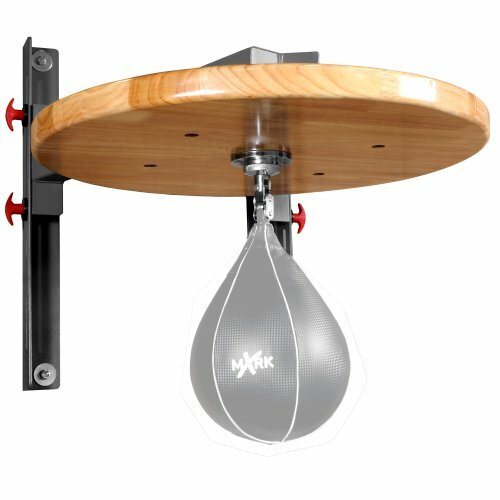 Boost your eye-hand coordination, Rhythm, and timing with the x-mark XM-4441 adjustable speed bag platform. Constructed of heavy gauge steel and a beautifully finished 1 1/2 inch drum of hardwood, the XM-4441 minimizes vibration and maximizes your return. The XM-4441 also easily adjusts to accommodate athletes of all sizes. The x-mark speed bag platform mounts on standard household wall studs that are 16 inches apart. 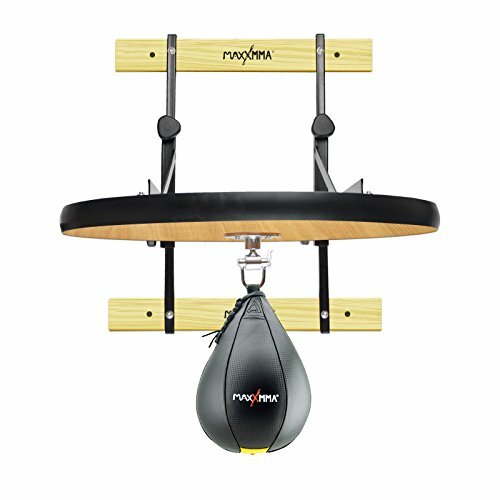 This speed bag platform will quickly become one of the favorite pieces of equipment in your home gym. Give your hand-eye coordination and boxing training a boost with the XMark Adjustable Speed Bag Platform XM-2811. 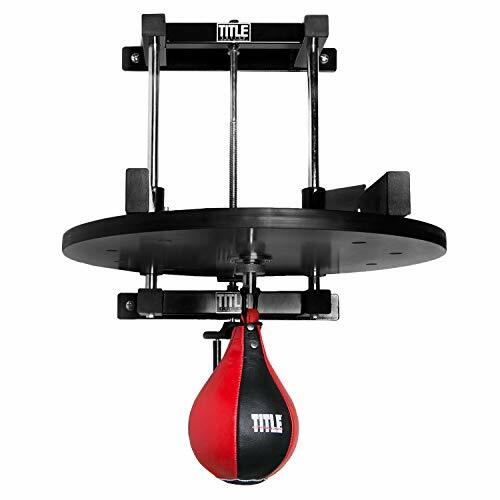 This heavy duty solid design minimizes vibration while working the speed bag. With a 15 inch height adjustment, the XM-2811 accommodates all athletes. The XMark XM-2811 is the perfect complement to the XM-2845 heavy bag stand. Dimensions: 31.5"" x 24"" x 23.5"". Speed bag not included with this product. 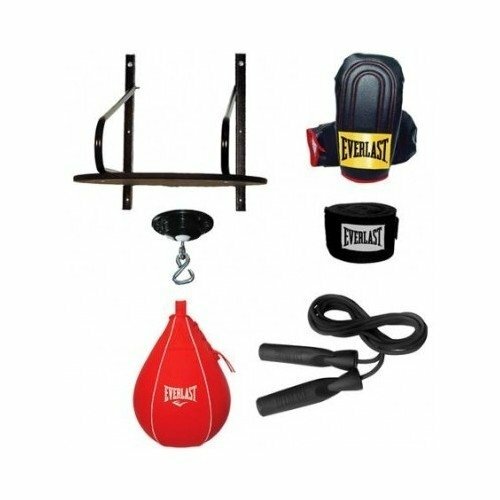 Constructed of extra durable 1" tubular steel for a solid, sturdy and professional speed bag workout. Features a 7" adjustable track to easily raise and lower platform to perfectly fit any size athlete in seconds. Durable 24" wooden drum platform and pro swivel make for super-fast and solid action. Complete with adjustment knobs on the sides for convenient and secure and secure raising and lowering of the platform. CA-10 Features: Packs the same punch as its big brother the CA-2. The only difference is one is adjustable and one is not. If you are the only user and can mount the unit in a fixed position, then this is the unit for you. Same Platform as the CA-2. Same Swivel and same Bag as the CA-2. Holds Small to Medium bags. (Comes with Bag and Pump). HIGH-QUALITY- 2 in. x 2 in. Frame holds the platform and frame together for maximum stability. in. X 2 in. Steel Mounting Face Plates provides security for the platform to prevent movement in the frame during use. FASTER RETURN- Made with 1-inch thick MDF to allow striking energy to be transferred back into speed bag. ROTATING SWIVEL- 360-degree rotating swivel allows the added speed and efficiency required in the boxing arena. FIXED POSITION- Ideal for a single user in home gym interested in working on hand eye coordination. ADDITIONAL- Valor Fitness Speed Bags are built to fit our products. If using another bag, the CA-2 should accommodate most S/M speed bags. Includes pump for Speed Bag. Warranty- 3-year frame and 1-year swivel. 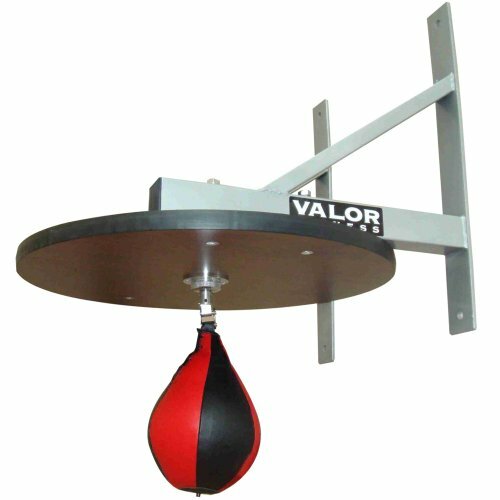 The Valor Fitness CA-50 is the 2-inch Boxing Speed Bag Platform sold individually. 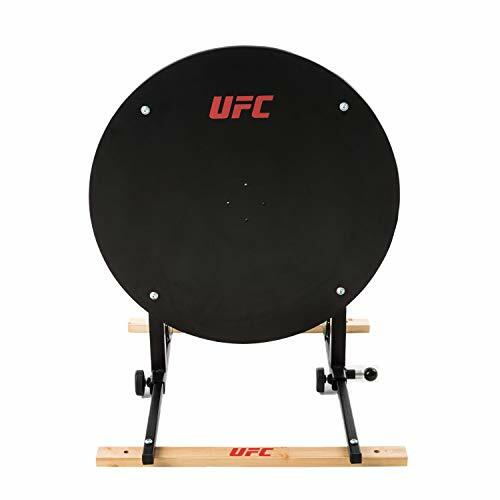 Made with 2-inch thick Medium Density Fiberboard (MDF) 23-inches in diameter to allow striking energy to be transferred back into speed bag. 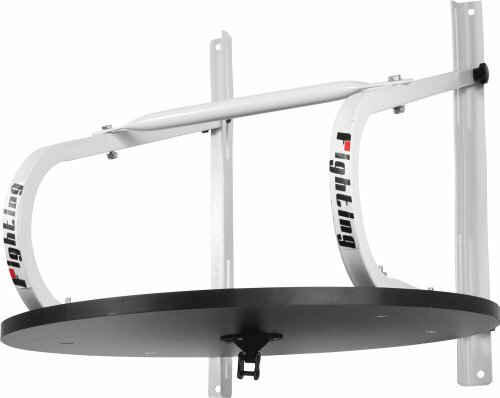 The platform sold without a mount, allows the user the option to create their own rig in a home gym instead of purchasing a wall mount. 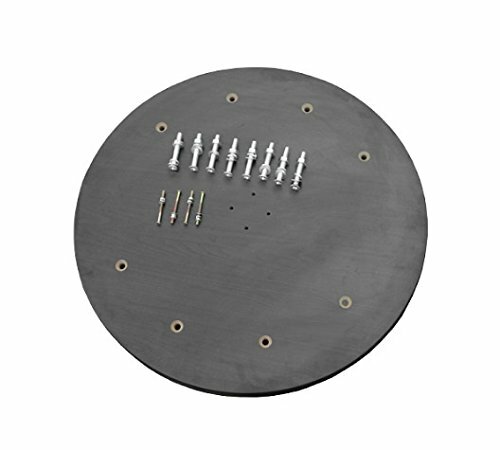 Includes 8 bracket installation bolts and nuts/washers and 4 Swivel installation bolts with nuts/washers. Meant for light-commercial use. 1-year warranty. 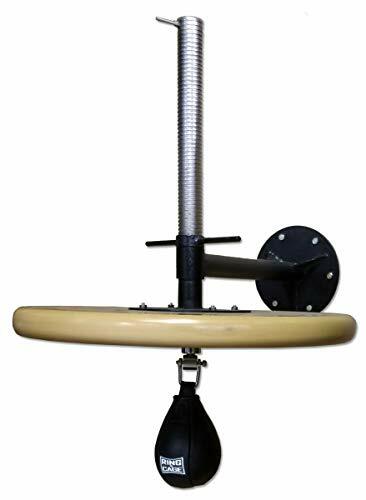 FASTER RETURN- Made with 2-inch thick Medium Density Fiberboard (MDF) 23 inches in diameter to allow striking energy to be transferred back into speed bag. CUSTOMIZATION- Allows the user the option to create their own rig in a home gym instead of purchasing a wall mount. Perfect for the Do It Yourself'er. PURCAHSE INCLUDES- 8 bracket installation bolts and nuts/washers and 4 Swivel installation bolts with nuts/washers. 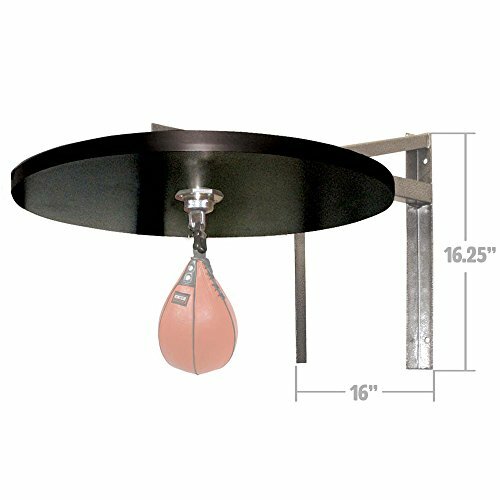 ADDITIONAL- Speed Bag Platform sold individually. 1-year warranty. 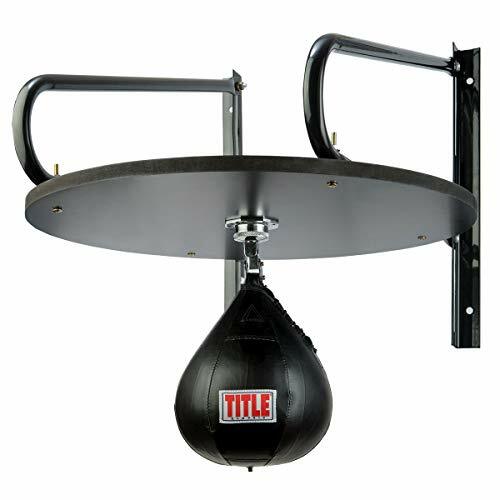 Adjustable Speed bag Platform: 16 inch height adjustable, wall-mounted speed bag platform. Frame is double layer laminated wood to avoid any vibration, powder coated for scratch resistance and durability. 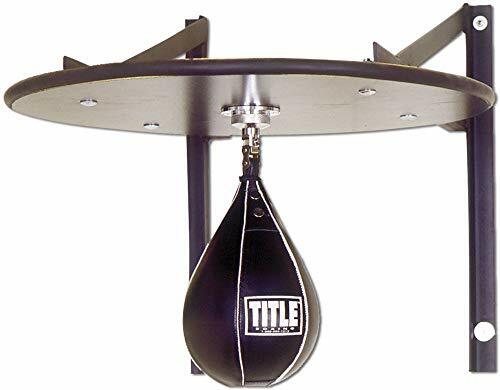 The platform includes about 2 inches hardwood with 23 inches diameter, made of 2" inches steel pipe a professional speed bag swivel included. 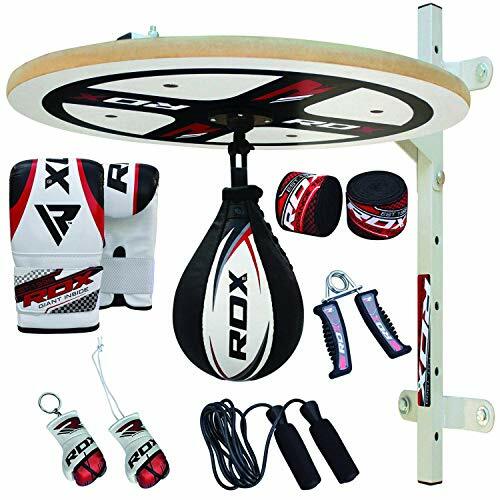 The platform includes about 2 inches hardwood with 23 inches diameter, made of 2 inches steel pipe a professional speed bag swivel included. HIGH-QUALITY- 2 in. x 2 in. Frame with 1 inch 12-gauge Steel tubes hold the platform and frame together for maximum stability. Mounting brackets allow the user to mount the platform onto a wall. Cement Anchors and Wood Lag Bolts are provided. FASTER RETURN- Made with 2-in. thick MDF (23 in. diameter) and reinforced with 2 Solid Steel Chrome tubes to allow striking energy to be transferred back into speed bag. 360-degree rotating swivel allows the added speed and efficiency required in boxing. ADJUSTABLE WORM DRIVE- Easy to adjust, Worm Drive accommodates all athletes by allowing each user to choose their desired height. Allows for a 12-inch adjustable range of motion. ADDED STABILITY- Four locking screw nuts on back of frame prevent shaking. Simply turn the locks to loosen and move platform to desired level with the wheel crank below the unit and retighten. Unit will easily slide on Chrome-plated tubes. ADDITIONAL- Valor Fitness Speed Bags are built to fit our products. If using another bag, the CA-53 should accommodate most S/M speed bags. - 3-year frame, 1-year swivel, 1-year wheel crank. Partially assembled for your convenience. The product is made to the highest specification and is quality tested and guaranteed. THIS SET CONSISTS OF: 1. SPEED BALL PLATFORM 600mm x 18mm MDF board white finish both sides ultra stable this is the wooden platform that the ball attaches to using the ball bearing swivel. It is held in place onto the wall using the metal bracket and has been coated with high quality waterproof Enamel paint for lasting durability. 2. METAL WALL BRACKET simply remove bolt and three re-position for height adjustment removal or folding. Which allow you to affix platform at any desired height on the wall. The bracket is made from Metal which has been made to the highest standard and then powder coated to protect the metal from rust and scratches. 3. SPEEDBALL is made from Maya hide leather and is laminated inside with several layers of cloth to give it the weight, strength and life. The ball is hand stitched and has a beautiful design with white stripes contrasting each panel. It is inflated using a regular football pump. 4. SWIVEL is finished in beautiful chrome; it has a removable design which allows it to be removed as desired. 5. LEATHER GEL GLOVES Ideal for speed ball and bag works with super dense integrated gel and liner hook-and-loop cuff allows easy on and off. Pro design for speed and combo punching. 6. PAIR OF HAND WRAPS is made from a poly cotton mix and can be used as inner for professional boxers or can be used while practising on the speedball set. 7. HAND GRIPPERS allows you to build muscles for wrist and arms. 8. KEY CHAIN is an accessory range. This unique Leather Maui Thai Kickboxing Boxing Glove key rings are made leather. 9. WRIST BAND gives extra wrist support at max level. 10. BOLTS, wall plugs, nuts and bolts. 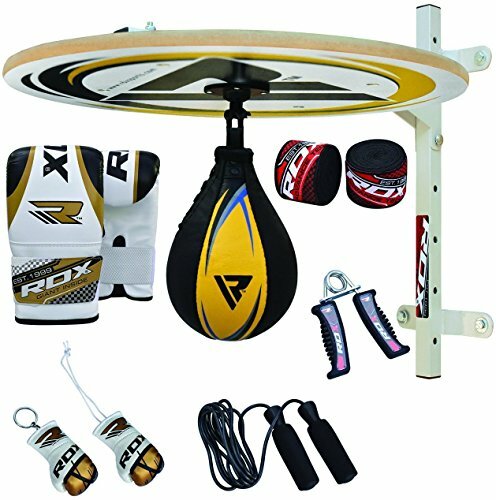 10PC complete RDX Speedball platform set which includes all the necessary items. Speedball platform, Metal Wall Bracket, Maya Hide Leather Speedball. Extra heavy-duty steel frame is built for industrial gym use and professional workouts. 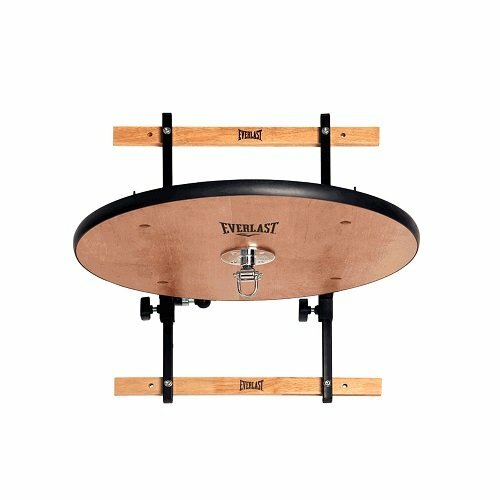 High density 24" diameter walnut laminated wood platform is built for solid, lightning quick and true rebounds. Includes solid steel chrome guide shafts and precision 14" worm drive height adjustment, which makes it perfect for all athletes from kids to adults. Complete with pro style swivel and all hardware to assemble. Design is ideal for low ceiling heights and home use. Speed bags 7" x 10" or smaller are recommended. Speed bag not included. Assembled Size: 32" x 20" x 31"
Adjust the platform to the ideal height for proper form in training. 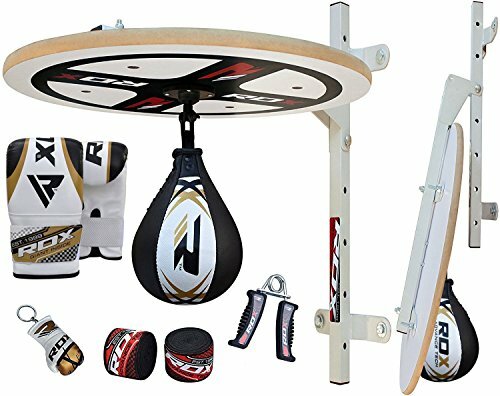 Simple to assemble, you can get started on speed bag training quickly. Speed bag is not included. Space efficient design All steel frame 24" diameter platform Additional shipping charges apply for this item. The exact amount is quoted at the checkout or by selecting to estimate your shipping charges in your shopping cart. A full .75" thick hardwood board with black powder-coated steel brackets for amazing speed, response and durability. Ideal for home use for all ages, sizes and abilities. Attaches easily onto a 16" wood studs or masonry walls. Features a 7" adjustable track to raise and lower platform to ideal height for all users. Comes complete with everything shown. Includes installation hardware for masonry walls. Installation hardware for wood stud walls sold separately. Powder-coated steel tubing and angle iron design for a heavy-duty, high quality platform. Expert design makes for use in lower ceiling heights. No high arching supports to take up room. Platform is approximately 1" thick Formica coated board and 24" in diameter. Designed to attach onto 16" wood stud walls or masonry walls in home or gym. Comes complete with professional steel swivel. Speed bag not included. Requires additional Wall Mounting Hardware (below). Designed with the same quality philosophy as Balazs Boxing's professional products, the i-Box Speed Bag Platform sports a super stiff V-frame bracket made from 11 gauge steel tubing and 1-1/4" thick manufactured wood drum for a high performance workout. The solid rebounding action will elevate your proficiency and accelerate your learning curve. The i-Box SBP is perfect for the budget-minded consumer looking for a high quality speed bag platform for their home gym. The i-Box SBP is available in 3 colors: Champion Black, Knockout Red and Contender Yellow. The sheer beauty of this product will get your heart rate up before you even start your workout and its high performance will keep you focused. The i-Box SBP adjusts more than 12" vertically to accommodate everyone in the family. The ergonomic knobs lock tight against the rails for a secure hold. The clear coated 1-1/4" thick manufactured wood drum is 24" in diameter allowing any size speed bag to be used. The platform includes a quiet and easy to use Everlast swivel. The i-Box SBP is powdercoated with a durable, glossy finish to complement the natural beauty of the surface finished wood drum. Speed bag not included. Ideal for the home gym! More than 12 of adjustability.